You can renew your tub or shower area without the expense, effort, and environmental cost of junking your old tub. If it’s stained or chipped or you don’t like the color, having your existing cast-iron tub re-glazed can save you 70 percent over the cost of buying and installing a brand new one. Acrylic or fiberglass tubs can also be repaired and re-coated for a fresh start. If you do decide to replace your tub, there are lots to choose from. Acrylic, fiberglass and porcelain on steel are the least expensive, and cast iron is very durable and popular. 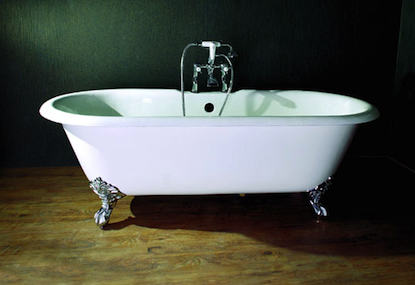 Vintage clawfoot tubs are seeing a revival. If you’ve got the space and the budget, check out the new designer Stand-alone sculptural tubs. Then there are spa tubs with champagne bubbles, hydrotherapy jets and even TV screens. Your tub may become your favorite piece of furniture.